Strip Pix are a totally new way to collect and display my photography. The possibilities are endless. 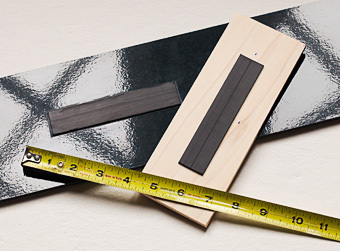 Strip Pix start with an advanced, rigid, lightweight panel measuring 5 x 30 inches. I then print each photographic strip to that size and mount it to the panel with an archival, acrylic adhesive. Each individual panel is actually a finished piece of art, but you can of course recreate the entire original photograph by adding more panels. Examples shown below consist of 7-panel and 3-panel Strip Pix. Any of my photographs from other galleries on my website can be created as Strip Pix! I'll be adding a lot more examples to this page soon, including examples showing the strips in a horizontal orientation. How do Strip Pix hang on your wall? Have you ever tried to hang several things on your wall and get them to line up? Wasn't easy, was it? Strip Pix solve that problem with my Floating Magnetic Hanging System. Each photographic strip is expertly mounted to Gatorboard, a tough, lightweight panel. Think foam board on steroids. My Gatorboard is laminate-sealed on the back for excellent warp resistance, and the photograph is sealed on the front with a UV and water-resistant lacquer. Simply attach the included mounting block to your wall with a tiny nail. The mounting block and the photograph panel have opposite-polarity magnets pre-attached, and the panel will pop right onto the mounting block. The cool part is if you have several Strip Pix to align, the magnets give you some wiggle room to line them up exactly. Your Strip Pix will float off the wall about 3/8 inch, giving additional depth to your installation. What about sizing? Each panel measures 5 x 30 inches. 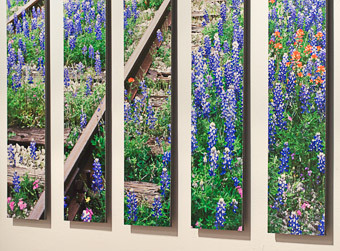 An installation of a full 7-panel photograph will measure about 30 x 44-48 inches, depending on your spacing of the panels. I recommend about 1.5-2 inches spacing between panels, for visual coherence of the image. Even though parts of the photograph are "missing" in between panels, your eyes will fill in those parts for a wonderful added dimension to the art.